Wow what an experience! There is so much I could say about this amazing experience. 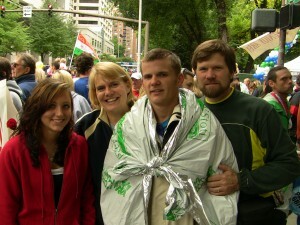 I was hoping the Portland Marathon would be something I would never forget and I was definitely not disappointed. I can remember the incredible rush of the start and the intense mental battle of the last eight miles. I felt great for the first thirteen miles of the race, flying along, way ahead of pace. But, after muscling my way up the St. John’s bridge on mile sixteen the fatigue was really starting to set in. I made it all the way to mile twenty before the muscle cramps started, but luckily they weren’t enough to keep me from pushing on. It was such an encouragement to have my family and friends there, cheering and willing me on. They met me at every mile marker they could and I am very grateful for their efforts. Without them there, it definitely would have been way more of a struggle. By the time I made it to the mile twenty-three marker I was hardly running anymore. My lower body would only continue to move at the mercy of my determination, and my silent prayers to God that he would help me survive. I can’t say that I have ever been more happy to see the finish line of a race. When I turned the corner and saw the time I was filled with a great sense of accomplishment. I crossed the line with a time of 3hrs 9 minutes and 18seconds! I had finally achieved what I set out to do over four months ago. I could hardly stand under my own strength, let alone walk at the end, but it was all worth it. 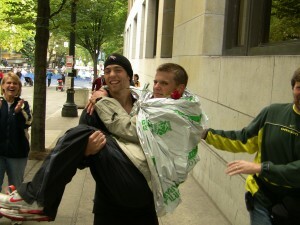 I also had my fellow train2move athlete Loren there to assist me at the end. I had qualified for the Boston Marathon in my very first Marathon! I may not feel so great now but I already can’t wait to gt back out there and run it again. Today will be a day I will always remember! Thanks again to all my family and friends, I couldn’t have done it without you. Watch out Boston, here I come!! Great job Josh what an amazing accomplishment. Your a testment to what hard work, correct training, and a competitive spirit is all about. I couldn’t be more happy for you. Great job in giving God the glory.